Below is a clip showing the received r-f spectrum of an AM broadcast station, at one instant of time. The carrier plus its upper and lower sidebands are clearly visible. The two sidebands are mirror images of each other, because they are produced by a process where the audio program modulation creates sum and difference r-f spectra, referenced to the carrier frequency. The sidebands extend to about 9.5 kHz above and below the carrier frequency. This means that an AM receiver with reasonably flat r-f/i-f bandwidth response and able to pass that complete spectrum from 920-940 kHz could have a useful audio output bandwidth of ~20 Hz to ~9 kHz. Many listeners to audio of that bandwidth would find it fairly indistinguishable from the audio bandwidth received from FM broadcast stations. Most consumer-level receivers for the AM broadcast band are not designed to receive/reproduce program audio having a 20 Hz-9 kHz bandwidth. But that limitation is not a function of the capabilities of amplitude modulation itself, or the useful r-f channel bandwidth permitted by the 10 kHz carrier spacing of AM broadcast stations. But that limitation is not a function of the capabilities of amplitude modulation itself, or the useful r-f channel bandwidth permitted by the 10 kHz carrier spacing of AM broadcast stations. For consumer receivers in the AM broadcast band, it *is* a function of the permitted bandwidth for AM broadcast stations. The NRSC equalization curves for transmission and reception of b’cast stations specify both what has to be transmitted as well as what needs to be received. Prior to NRSC, receiver manufacturers would avoid bandwidths approaching 20kc because of the lower S/N ratios, adjacent channel noise, 10kc beat frequencies, and basic economics. None of those contribute to receiver sales. ... The NRSC equalization curves for transmission and reception of b’cast stations specify both what has to be transmitted as well as what needs to be received. The NRSC AM transmit curves were based on recommended r-f/i-f bandwidth characteristics for AM broadcast receivers — but the receiver OEMs were never required by the FCC to produce receivers actually having those characteristics. Consequently few AM broadcast receivers used by the general public are capable of receiving or reproducing audio bandwidths out to 9.5 kHz, even when AM stations modulate out to ± 9.5 kHz. A good share of the AM broadcast stations transmitting in "hybrid" HD mode use an upper audio frequency limit of about 4.5 kHz for the analog program material they transmit. I love the Radio Craftsmen RC-10 tuner that I got from my dad back in the 1960's when I was maybe 10 years old. Wide IF and true 10KC LC notch filter. I loved listening to AM back then in Tucson AZ, http://www.ktkt99.com KTKT 990, "Channel 99" excellent AM rock sound. Those were the days! (b) Emissions 10.2 kHz to 20 kHz removed from the carrier must be attenuated at least 25 dB below the unmodulated carrier level, emissions 20 kHz to 30 kHz removed from the carrier must be attenuated at least 35 dB below the unmodulated carrier level, emissions 30 kHz to 60 kHz removed from the carrier must be attenuated at least [5 + 1 dB/kHz] below the unmodulated carrier level, and emissions between 60 kHz and 75 kHz of the carrier frequency must be attenuated at least 65 dB below the unmodulated carrier level. Emissions removed by more than 75 kHz must be attenuated at least 43 + 10 Log (Power in watts) or 80 dB below the unmodulated carrier level, whichever is the lesser attenuation, except for transmitters having power less than 158 watts, where the attenuation must be at least 65 dB below carrier level. Here is a close in pic showing the spectrum of an AM carrier modulated with a 1Kc tone. The span is 1Kc/Div Horizontally, and 10db/div vertical. SSB transmitters typically have a 2.4 to 3.1 or so Kc wide crystal filter, so only one sideband and "no carrier" is transmitted. That sideband is limited to the width of the previously mentioned crystal filter. Thus any audio above the filter bandwidth is not transmitted. Phasing SSB transmitters on the other hand, can have one sidband bandwidths approaching the 9.5 Kc mentioned by the OP. Much better sounding audio. 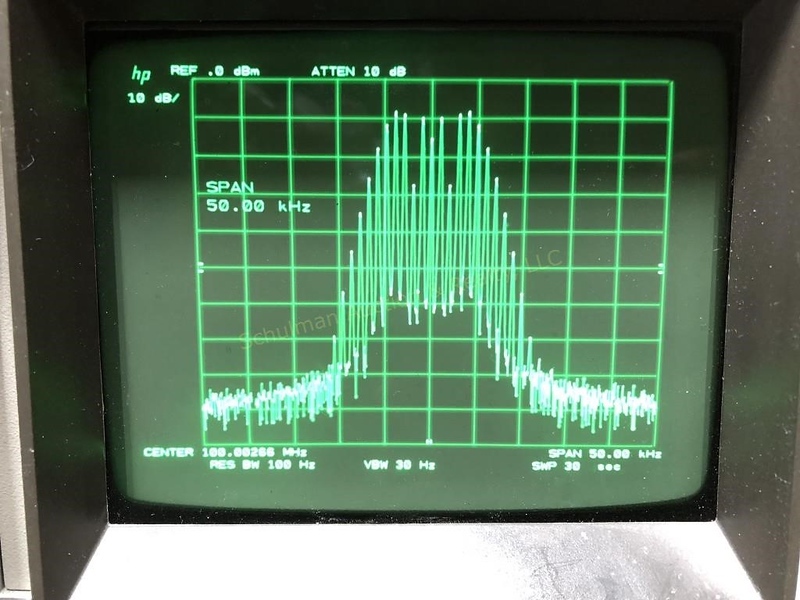 Just a quick question about the part of your post quoted above: The r-f spectrum of a DSB (A3a) AM transmitter with 100% (or less) modulation by a 1 kHz sine wave would consist of three signals — the carrier, one signal 1 kHz above the carrier frequency, and one signal 1 kHz below the carrier frequency. 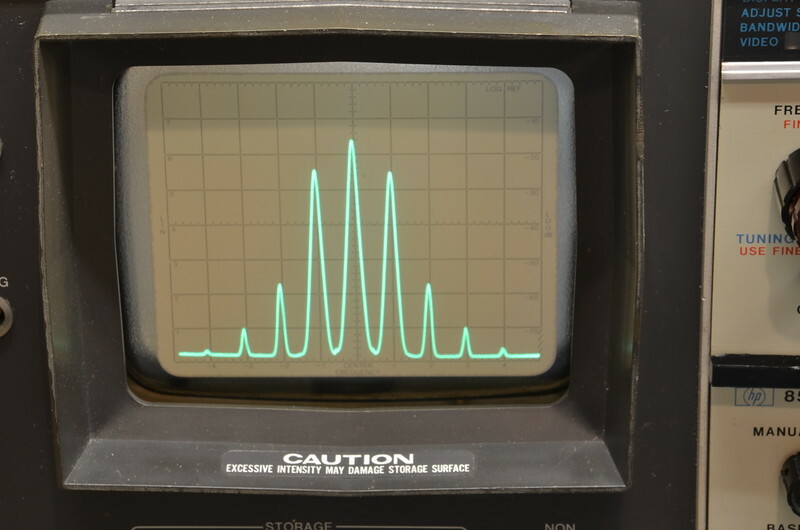 Could you please identify the other signals shown in your spectrum display? TIA. be three distinct spectrum lines, separated by 1 KHz intervals. (and intermodulation distortion, if more than just a single audio input tone is present). His spectrum analyzer is showing a real-world AM transmitter result. Not only would it consist of just 3 individual signals, the individual side ands would be down 6dB from carrier power. Not a very good picture to describe the text. Looks like an fm modulated signal. Or a severely overmodulated am signal. The two sidebands are 6db down from the carrier, and the other sidebands are the cumulation of distortion products, approximately 3% or so in this example, as Ed described. No FM or over modulation involved. Here is what an FM spectrum, modulated with a 1000 cycle tone looks like. It's nothing like the AM spectrum as shown in my earlier post. I stand corrected. That sure is a departure from textbook! Is it possible to calculate distortion from the original Pic posted? I ask as a spec an is new here, and it would be nice to know an(other) use. Sure, its simple, its just a matter of Voltage ratios. Since each horizontal line in the pic is 10db, you can easily see that the second set of side bands are shown to be about 30db down from the first set, and the third set of side bands are 12db further yet, thus my 3% distortion approximation. If you want to nit pic, its more like 4%, but still not all that bad for Comm audio.